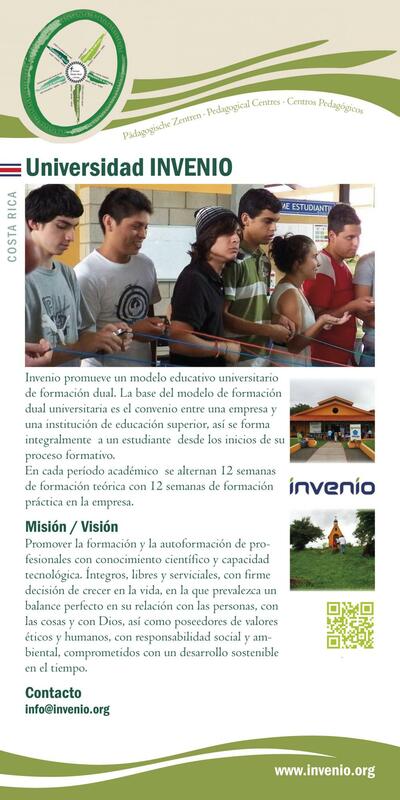 Invenio is a science-orientated technical university in Costa Rica that works according to a dual educational model. It is based on an agreement between the university and businesses, so from the beginning it is possible for students to experience an integrated training process. During this dual course of studies complementary blocks (each lasting 12 weeks per semester) of theory and praxis alternate; the training becomes a task in which the university and entre- preneurs collaborate in the professional development of the students. The vision of the university is the development of a new pedagogical model for the education and training of graduates with high ethical and moral values, who feel responsible for society and the ecology, and who are committed to sustainable development: The new person who renews society.